You can now purchase AFTERSHOCK from The Game Crafter. To visit their shop, click the “shop now” button on the right. For information on forthcoming AFTERSHOCK demonstrations, click here. 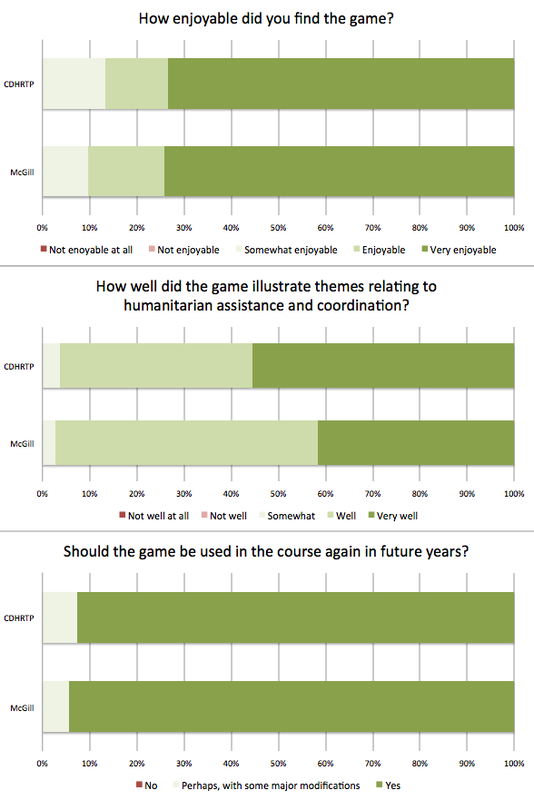 If you would enquire about the cost of a fully-facilitated AFTERSHOCK humanitarian assistance/disaster relief training session for your group, or about the customization of game materials for your organization or specific needs, please email us. All profits from the sale of the game are donated to the World Food Programme and other UN humanitarian agencies. 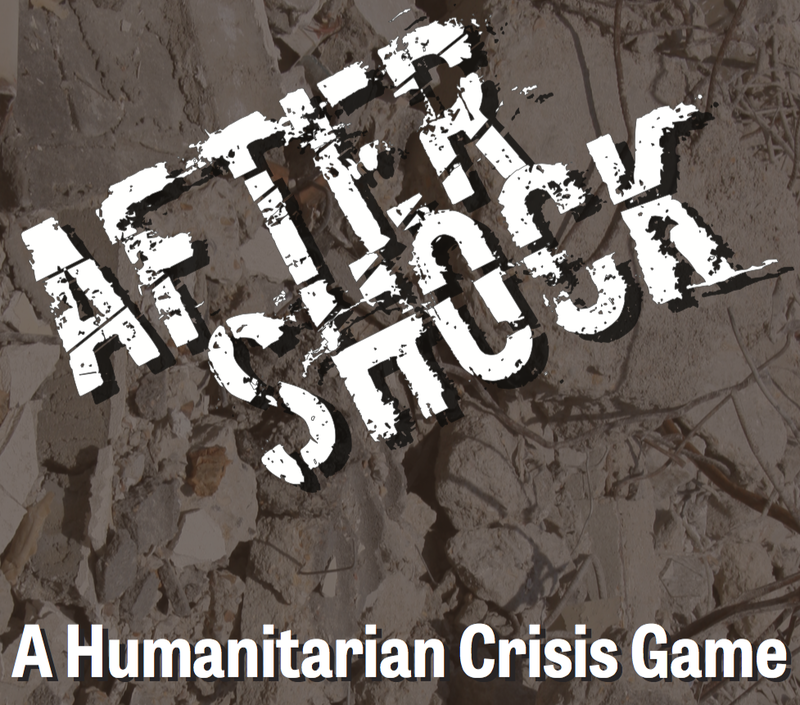 AFTERSHOCK: A Humanitarian Crisis Game is a boardgame that explores the interagency cooperation needed to address the emergency and early recovery phase of a complex humanitarian crisis. Designed for 4-8 players, it can be played with fewer (even solitaire), or more (with players grouped into larger teams). Game play takes two hours. At dawn today, a powerful earthquake struck the capital city of Galasi, causing widespread destruction of homes and infrastructure. Tens of thousands of people are in need of urgent aid and medical attention. At the request of the government of Carana, military forces from several friendly countries—operating as the multinational Humanitarian Assistance and Disaster Relief Task Force, or HADR-TF—are en route to assist, as are additional contingents of UN and NGO personnel together with much-needed relief supplies. The game covers approximately three months of humanitarian operations, including both the initial emergency and a later period of early recovery. Because Carana is a fragile, conflict-affected country, relief and reconstruction efforts may also involve issues of social unrest and political instability, especially during the early recovery stage once the initial shock of the crisis has worn off. Assign aid personnel to front-line relief, earthquake rescue, needs assessment, coordination meetings, media outreach, and other tasks. The primary objective of all players is to address the urgent humanitarian needs of the local population. However, players also need to maintain public and political support for their organizations, whether to govern (Carana), sustain the relief mission (HADR-TF), or secure financial support (UN and NGOs). Each district of the capital is in need of urgent humanitarian assistance, as well as presenting other challenges. A needs assessment would take staff and time—but would help teams to plan ahead. Participation in coordination meetings with other players can aid in humanitarian response. However, there are always new challenges and unforeseen events to contend with. PAXsims will be releasing several expansion sets for AFTERSHOCK that highlight specific themes and issues. The first of these expansions focuses on the gender dimensions of humanitarian assistance and disaster relief. A list of forthcoming demonstration games can be found here. 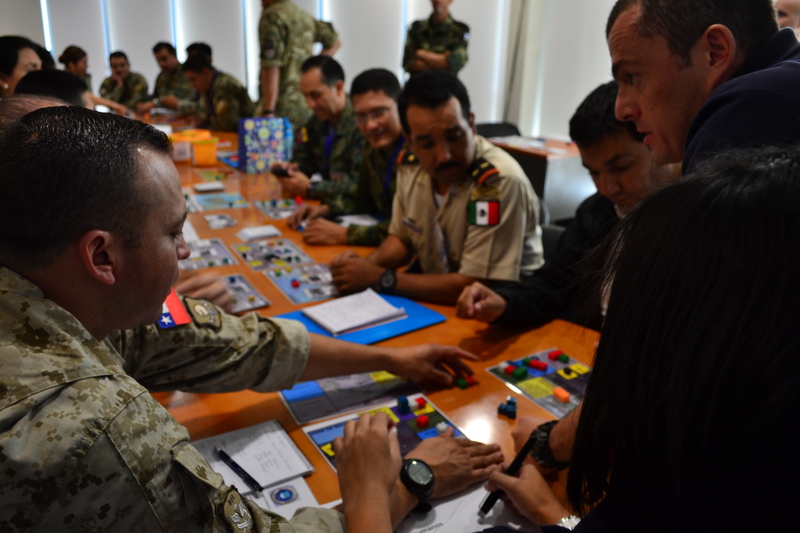 AFTERSHOCK at the Chilean Joint Peacekeeping Operations Center. AFTERSHOCK at National Defense University. AFTERSHOCK being played by members of the 9th Mission Support Command, US Army Reserve. AFTERSHOCK at the Université de Technologie de Troyes. 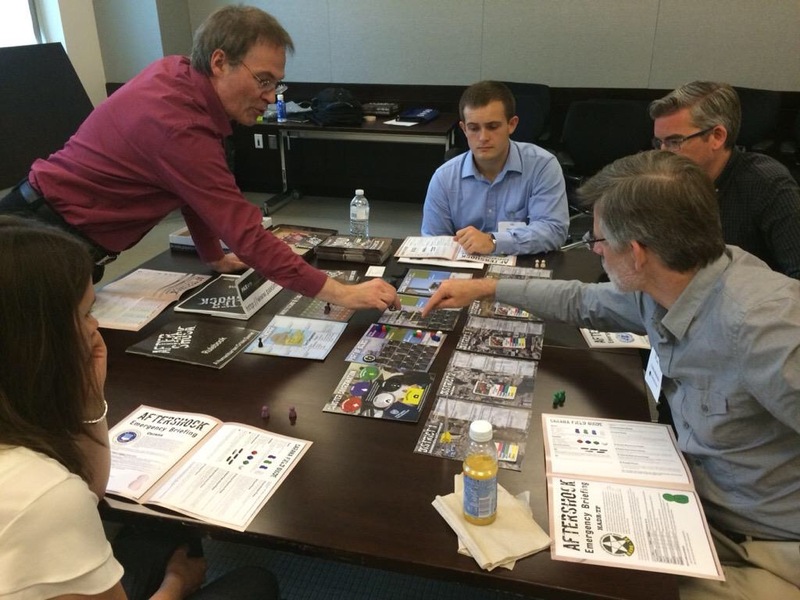 AFTERSHOCK at the Connections 2015 interdisciplinary wargaming conference. For thoughts on how to introduce and facilitate AFTERSHOCK in the classroom, see also this post on PAXsims. 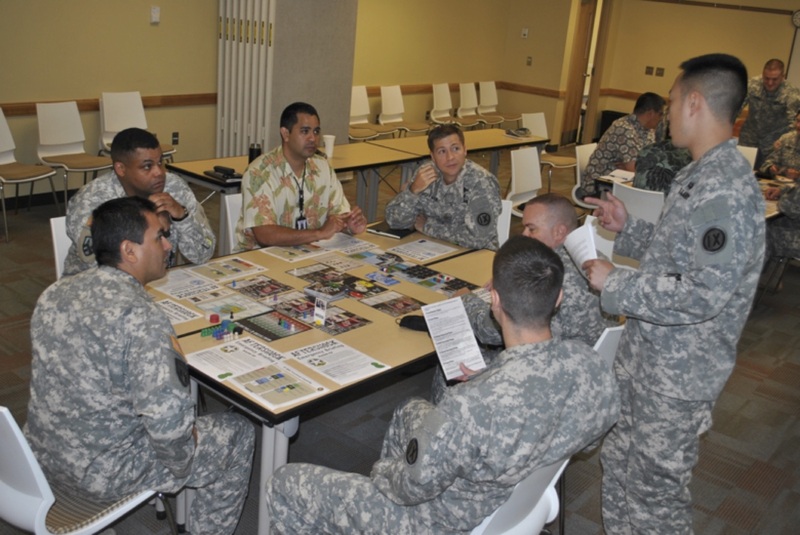 AFTERSHOCK grew out of the “game lab” held at the 2013 Connections interdisciplinary wargaming conference, which focused on HADR operations following the 2010 Haiti earthquake. The game design was subsequently developed by Rex Brynen and Tom Fisher. Rex Brynen is Professor of Political Science at McGill University, where he teaches courses on humanitarian and peace operations. Author or editor of eleven books on various aspects of security, politics, and development in the Middle East, he is coeditor of the conflict simulation and serious games website PAXsims. In addition to his academic work, he has served as a member of the Policy Staff of the Canadian Department of Foreign Affairs, an intelligence analyst for the Privy Council (cabinet) Office, and as a consultant to other government departments, aid organizations, the World Bank, and United Nations agencies. In 2011 he won in International Studies Association’s Deborah Gerner Innovative Teaching Award for his work on educational games. Thomas Fisher is a freelance game designer, based in Montréal. He has previously designed professional education simulations for the World Bank and the Egmont Group of national financial intelligence agencies. Special thanks are due to David Becker, Brant Guillory, Ty Mayfield, Gary Milante, Joshua Riojas, and Brian Train for co-facilitating discussions at the Connections conference, and to Eric Freeman, June McCabe, Ecem Oskay, Hiba Zerrougui, and others from the McGill Conflict Simulation Group for help with playtesting. If you have questions about playing the game, check out our AFTERSHOCK FAQs page. I have a rules Question about the game. Three newly arrived supplies are used to convert to a infrastructure counter. Does this conversion take place before or AFTER the supplies are brought in via the airport or seaport? If conversion AFTER the supplies are landed the seaport’s initial status of 1 supply prevents it being repaired by international aid. Is the intent to prevent any but the local government to perform this initial upgrade to the seaport? This is a key factor as the seaport is the only point that all parties warehouses are available for sharing. The conversion takes place BEFORE the supplies/infrastructure “arrives.” An infrastructure marker still only counts as one item, therefore you are able to bring one into the port despite its initially heavily-damaged state. Are there any videos of a complete game being played. I have read the rule book, but it would be nice to see how it all flows before attempting to play. Not yet, no. Time permitting we may video a couple of turns at some point. Hi, I am just introducing Aftershock in my course and have one important question related to capacity constraints in the Airport/port (which kind of defines the game and purpose to show how important logistics is). It appears as if upgrading the Airport is much more favorable than upgrading the port. When we played the game we just upgraded the Airport and never had any issues with logistics/constraints to bring in supplies. We feel that we have missed something and would appreciate some guidance. Generally it makes more sense to upgrade the Airport, at least initially (and indeed this what was done in the Haiti earthquake). If players aggressively upgrade either the Port or Airport they should be OK. Remember, however, that to upgraded you need to: 1) buy the upgrade, and count it against incoming capacity for that turn, 2) next turn, have a team allocated to the Logistics cluster, and then perform the upgrade in the Special Operations phase of that turn. It thus takes a while and is resource intensive. Thanks for a quick reply, and I believe your comments make sense. I then have two follow-up questions that are related to the ports and capacity constraints. 1. If a player decides to transform supplies (3 similar or 3 different) to an infrastructure marker, does that infrastructure marker count as 1 or as 3 in the port/airport? 2. For the respective local warehouses in the port/airport, is there any overall capacity limit? If I understood correctly, the logistics capacity constraint in the port/airport only applies to all new supplies brought in during one round. The next round, the players can bring in equally as much, or? 1. An infrastructure token counts as one item for the purposes of port/airport capacity, regardless of how much a player “paid” for it. 2. There is no total capacity limit, and as you correctly note the logistics counters reset at the end of each game turn (not player turn). This means that it is the UN and especially the NGO player who may face problems bringing in material (Carana doesn’t have to worry about the restrictions, while HADR-TF moves early and so the port and airport are never full yet). This was a deliberate design decision: in Haiti, military then UN flights were given priority, while NGOs often complained they couldn’t get landing slots. If your HADR-TF player is aggressively upgrading logistics infrastructure early in the game, this probably means that either i) they’re gamers and foresee the potential bottleneck problem, or 2) they understand the importance of logistics in humanitarian operations. Many players will, unless prompted, focus on supplies, fill the port and airport, and then have overflow at the frontier. In this sense the game is very much about highlighting the importance of proper planning rather than simply throwing bottles of water to orphans. Any chance of a game session write-up for PAXsims on your classroom use of AFTERSHOCK? What class are you using it for? 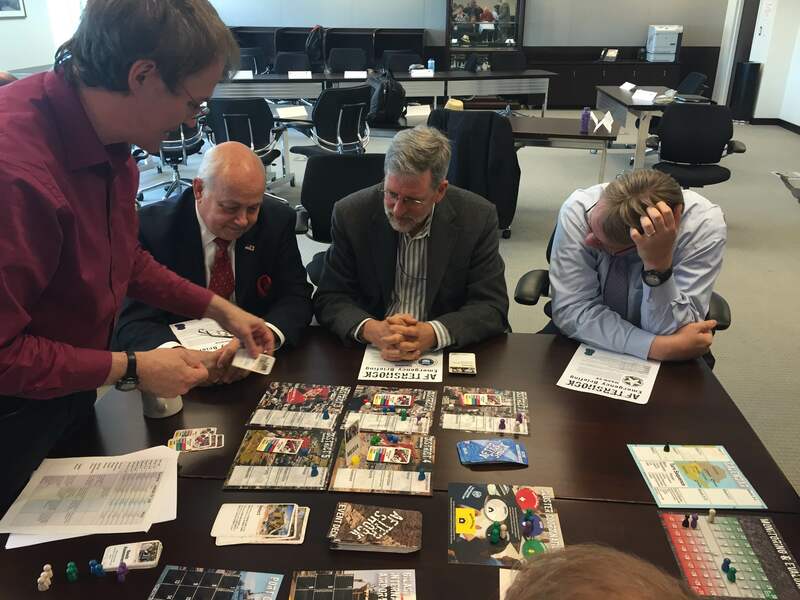 We would usually be looking for a description of the course (including other elements), a brief summary of how the game was conducted and what happened, then some discussion of learning outcomes, etc. On another note, have you seen the gender supplement to the game? It would be quite easy to develop a logistics supplement using the same mechanism. In the rulebook v5.0.2, page 6, the event card E-9 example box at the bottom, last sentence reads, “Further, Carana loses 1OP for the event.” Shouldn’t this read “team” instead of “OP”? Yes, both Carana and NGO each lose 1 OP due to the needs not being met which is stated in the prior paragraph. But the example doesn’t acknowledge the “needs not met” statement on the event card. That said, the paragraph at the top of the page, 2nd column, does reference this correctly. I’m sorry your group encountered some rules confusion. While that isn’t something we’ve run into before, we’re always happy to help out! You can email me any rules queries (rex.brynen@mcgill.ca), or raise them at BoardGameGeek. Are there any moral/ethical dilemmas that players are presented within the mechanics of Aftershock? Karim: Aid prioritization presents ethical/triage dilemmas throughout the game, and a few are also presented in the event cards. The “Gender Expansion” adds a lot more, because at times you have to make trade-offs between longer-term vs shorter-term goals. The game also comes with blank cards to allow customization, if there are particular dilemmas one wishes to insert. @Rex: Thank you so much for the reply, I’ll definitely get a copy of both the game and the expansion. I’m teaching a course on Intelligence Ethics this semester and I have been looking far and wide for any sort of game/simulation/system that either already has or allows for moral/ethical dilemmas to be part of the decision-making process. If any other materials come to mind, all recommendations are welcome! If you do decide to do an “Ethical Dilemmas in Humanitarian Aid” expansion, I’ll gladly offer any assistance you may need. I’m a graduate of the War Studies programme at King’s College London and Professor Philip Sabin always spoke very highly of you, it’d be a pleasure!